Over the past 15 years, terrorism has been on the rise. There has been a five-fold increase in terror related deaths since 2000. We have watched with horror these attacks on the news. From 9/11 to the Madrid bombings, from Tunisia to Kenya, from Paris, Turkey and now Brussels; it is clear that terrorist attacks are very diverse in terms of their location, the impact as well as the perpetrators. While these tragedies have often caught countries off-guard, they have enabled policymakers and the industry alike to better understand the implications of terrorism and how to better cope with and hopefully mitigate them in the future. But what does this mean for the travel and tourism industry, an industry whose success is entirely dependent on the ability of people to travel? Terrorism causes chaos and leads to panic and fear. Indeed, safety is a pre-requisite for the success of the tourism industry, and the mere threat of events can cause tourists to rethink their decision to visit a destination. The extent of cancellations differs greatly depending on the targeted destinations. For instance, following the attacks on 9/11, the US government closed airports and cancelled thousands of flights. Even when the airports re-opened, tourists were wary of air travel, and airlines experienced at least a 30% reduction in demand during the initial shock period. In the case of yesterday’s attacks, all flights in and out of Brussels have been cancelled and the entire Brussels transport system has been shut down including international train travel to Belgium. The airport will remain closed today but is expected to restart operations on Thursday. The attacks are likely to be extremely detrimental to Belgium’s tourism industry, at least in the short term, with Easter around the corner. In effect, this holiday weekend has typically brought many tourists to Belgium. On the basis of Belgium’s experience with the lockdown this past November, following the Paris bombings, the streets in Brussels could be deserted this weekend. In effect, the cost of terrorism includes the property destroyed and the number of cancellations. It also includes indirect costs which may be linked to the diversion of foreign investment, tourism, international trade, consumption, savings, unemployment and short term capital flows among others. Estimating the costs is extremely challenging given the direct and indirect costs, both short and long term, associated to terrorist attacks. Research on the Boston Bombings, however, tried to estimate the losses, amounting to approximately $438 million. This includes the costs of having a city on “lockdown”, property damages and even indirect medical costs (estimated at $31 million). While the economic cost on the country’s capital has not yet been established, it is likely to be costly both in terms of infrastructure but in tourism lost. In effect, the shutdown in Brussels after the Paris attacks cost an estimated €51.7 million ($57.9 million) per day during the lockdown according to Belgian broadcaster VRT. The tourism losses in France following the bombings last year were estimated to have cost €2 billion in lost earnings according to the French government. The hotel industry is becoming more resilient to shocks from terrorism. 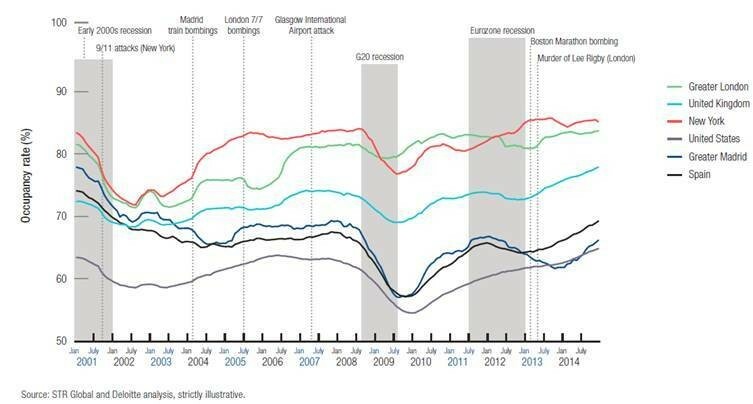 In effect, the time that it takes for destinations to recover from these shocks has significantly decreased over the past 15 years. For instance, occupancy levels in New York hotels took 34 months to recover from 9/11 attacks, and the wider US market took 45 months, with the impact compounded by an economic recession. In comparison, it took Madrid 12 months to recover from the 2003 train bombings and London nine months from the July 2005 attacks. More recently, the Boston Marathon bombing had a limited impact on hotel occupancies. The ability of nations and destinations to bounce back relatively quickly can be partly attributed to the design and implementation of security protocols. Being proactive, rather than reactive is a key success factor. It is essential for countries to have robust contingency plans, disaster recovery programmes and risk management protocols among others. It is also critical for countries to liaise with other nations in times of crisis, to support, and if required, collaborate on the evacuation of foreign nationals from the targeted areas. For instance, the recovery efforts following the Bali bombings in 2002 were designed only after the attack took place – which led to a slow and laborious recovery of tourist confidence and revenues. On the other hand, the response to the London Underground bombings in 2005 was quick and decisive, leading to little effects on the tourism industry. The Belgium government has been extremely reactive in the latest attacks and to date there are no restrictions on travel to Brussels or Belgium. Still, the threat level of the country has been raised to a 4, implying a “serious and imminent threat”. The Belgian Crisis centre has helped provide the most up-to-date information on the situation. Although domestic and regional travellers appear to be less deterred by isolated incidents, international demand is sensitive to the threat level portrayed by the press and travel advisories. Governments and businesses alike should take measures to re-boost the tourism sector once the situation has normalized, focusing on attracting the tourists, changing the perception through media by creating impactful communications campaigns and collaborating to develop strategies to attract new tourists. Following the lockdown in Brussels in November and the decrease in international tourist arrivals, the city launched in January a campaign to convince tourists of their safety in the city. In effect, Brussels had been portrayed, according to the CEO of visit.brussels, as a “war zone that tourists would do well to avoid”. Belgium will once again have to rebuilt its image following yesterday’s terrorist attacks on its capital. Given the impact of these events in terms of lives lost, damaged infrastructure and economic loss, it is clear that society must tackle these challenges head on. While every shock is different, what trends seem to reveal in terms of the travel and tourism industry is that destinations do bounce back in the medium to long term. How quickly they recover, however, depends on the country’s ability to manage the crisis both from a security and a PR perspective. Rather than managing crises in a reactive way, we should consider ways to be more proactive and look at how to implement the right measures to avoid them. This presents great opportunities for the industry and policy-makers to develop solutions to enhance security while enabling seamless travel. To do this, we should not only enhance the current framework in which we operate, but also come up with innovative solutions and new models for travel. Within the current travel framework, we could implement comprehensive technologically enabled solutions to enhance security and efficiency, ranging from re-envisioning the future of checkpoints and border controls to the improvement of data analytic tools and the application of e-visas, regional visa agreements and the expansion of trusted traveller programmes. Thinking beyond the current framework, leaders should consider the development of a new framework for global travellers, given the increasing consumption of international travel, but also the clear need to reconsider risk through a collaborative and cross-border approach. Indeed, while travel has become a way of life for people across the globe, current frameworks often assess risk levels on the basis of an individual’s nationality. The concept of “global access” or a global trusted traveller programme should be developed as a tool to enhance security and be the catalyst to shift our system verifying eligibility to travel from “country of origin” to an individual-based system facilitated by global cooperation. Such a system would enable “low risk” passengers to travel in an expedited way across borders, while enhancing global security standards through better inter-governmental cooperation. The mounting security concerns which have plagued society clearly show the need to reassess how we manage the movement of people. While the solution is not to close borders and reverse many of the positive developments of the past decade, we need to think together about how we can keep enabling society to experience the wonders of travel in a safe and secure environment.